One might consider that today’s topic has little to do with art but in fact the book I wish to focus on today is the combining of two great artists, both poets and hymn writers. 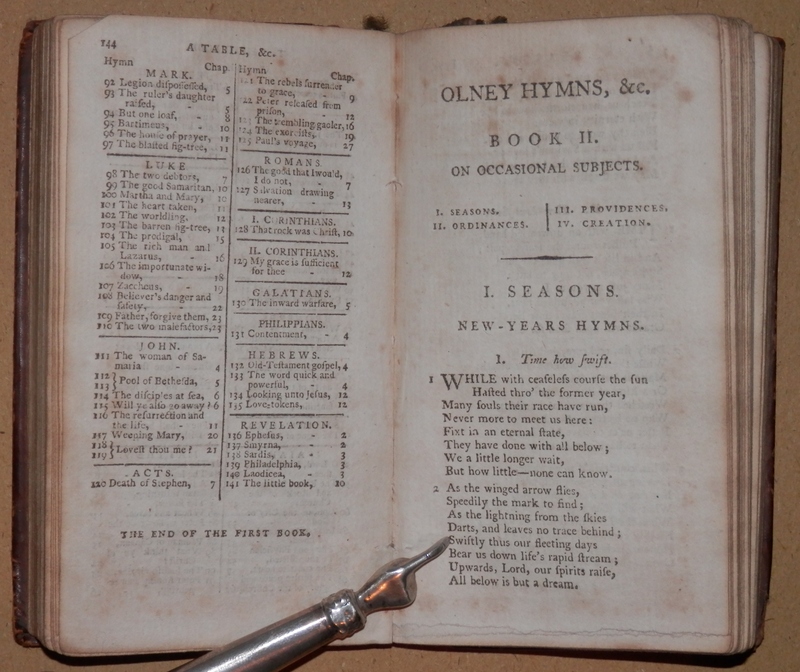 The #OlneyHymns is made up completely of works by #JohnNewton (1725-1807) and his great friend #WilliamCowper (1731-1800). 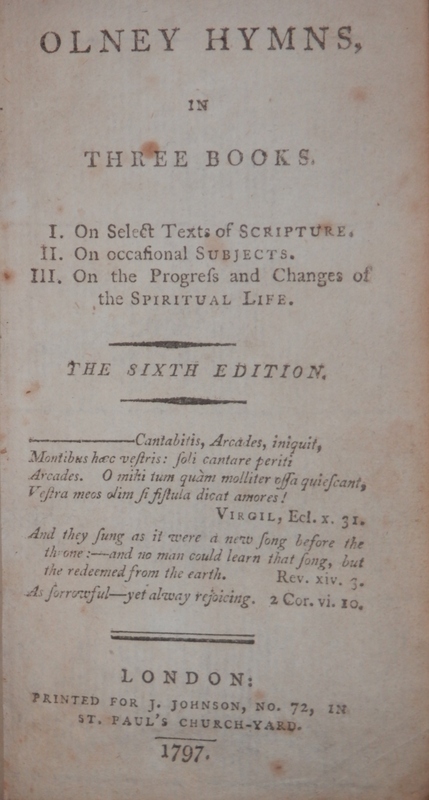 Compiled over a number of years the hymn book was initially published in 1779 and the hymns contained therein were meant for the use of Newton’s rural parish. His parish was not a wealthy one and most of his parishioners were uneducated. Newton, himself, was an only child and was self-educated. He rose to become a sea captain and at one time was involved in the capturing of slave ships. A violent storm while at sea revived Newton’s belief in God and he entered into the priesthood and was appointed priest at Olney in 1764. Here he remained for 16 years until he became rector at St Mary Woolnoth in London were he served for a further 28 years. William Cowper was a well educated son of an Anglican clergyman. As an adult, he suffered from depression and was entered into an asylum. During his stay in the asylum, he was visited by his cousin Martin Madan, and Evangelical preacher. Newton found an enthusiasm for Evangelicalism and when he moved to Olney in 1767, he became fast friends with John Newton. The hymns themselves are an expression of Newton’s and Cowper’s personal faith. They expound the tenets of the Evangelical faith – the depravity of man, conversion, atonement, activism, Biblical inerrancy, and the belief in life after death. The singing of hymns had become an established feature in the Evangelical church’s expression of devotion and worship by the 1760s. Of the 348 hymns Cowper penned just 66. A small number – mostly due to his ill health. There is no evidence that either Newton or Cowper composed music for their hymns. This likely means that they were sung to well known psalm tunes and possibly even the odd folk tune. Over the years certain hymns have become linked to individual melodies. Such is the case for Newton’s ‘Amazing Grace’ which since 1830 is joined to a Scottish?Irish melody. I am at present enjoying reading these hymns – many for the first time and in the near future will visit the Cowper and Newton Museum in Olney – it’s only a hour away. 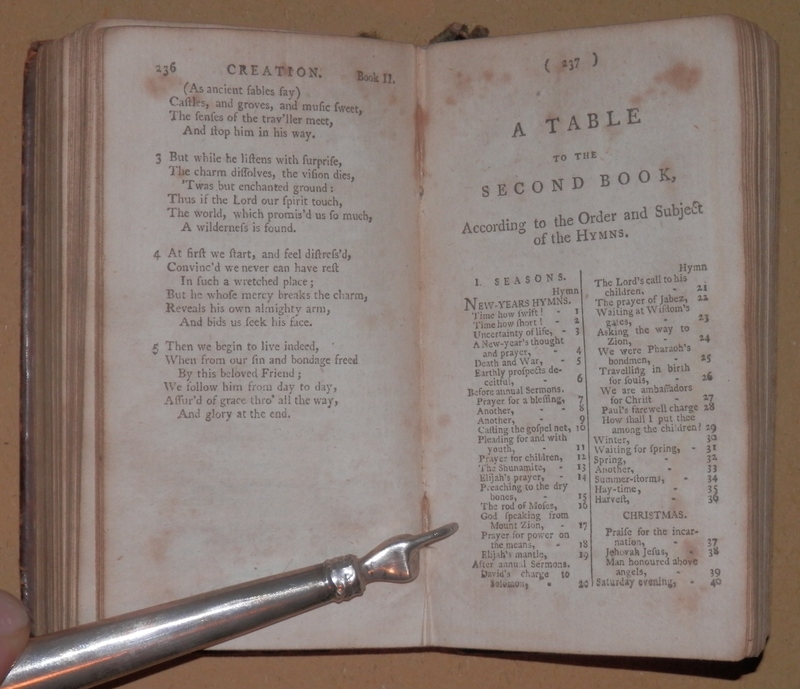 This entry was posted in Printing and tagged book, church, evangelical, hymn, John Newton, printing, psalm, William Cowper. Bookmark the permalink.